It is tempting—particularly among the childless—to hold children to a higher standard of conduct than their capabilities permit. This thought was inspired—at a matinee performance of Salt Lake Acting Company's sixth annual children's play A Year With Frog & Toad—by the arrival some way into the performance of a child who proceeded to make constant and loud comment on the proceedings, and who was then given a cell phone to play with for the remainder of the show. All of this, naturally, in the front row, some five feet away from any downstage action, because why not? Opportunities for entry into the Bad Audience Member Hall of Fame don't come every day. And yet, per that unrealistic standard of conduct, this is not the kid's fault. Nor, in a shocking plot twist, is it even the parent's. If one is to put up entertainment for children, one must expect children, and for them to be as they are. This is not a hazard of children's theater, but a function. Helpfully, the nature of Frog & Toad is such that one does not miss nuance or subtext as a result of these distractions. It is the simple story of two best friends, lent a reassuring air of permanence by its circular structure, and connection to nature by using each season of the year as a chapter. Then, as well, there are bright costumes, simple catchy songs and dancing, all of which are universal goods sorely lacking in grown-up entertainment. It's the kind of show that's perfect for its intended purpose, because even if one's attention wanders momentarily, the whole is still so completely and consistently itself that missing one line won't lead to problems "getting it." 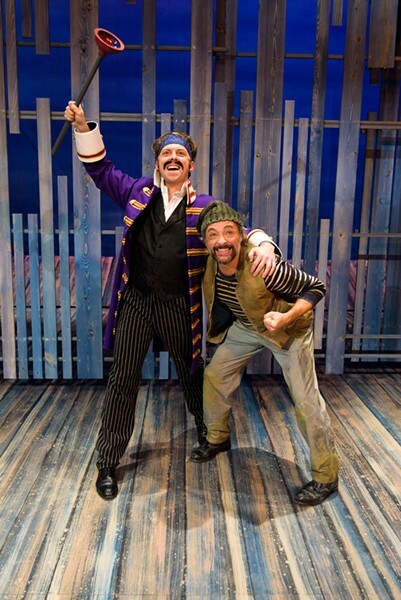 It's entirely possible that the kind of presentational style favored by both Frog & Toad and Pioneer Theatre Company's production of Peter & the Starcatcher is uniquely suitable to children's theater, and entertainment aimed at children in general. While kids might occasionally pretend to be grown-ups when playing make-believe, just as (if not more) often, their flights of fancy transcend the plausible, because it is better to simply be a dragon and a unicorn at the same time than it is to fret that such a thing, to say nothing of its component parts, does not exist. Given this, it makes sense that entertainment made for children, just as diversion made by them, should focus instead on what is fun rather than what is real. 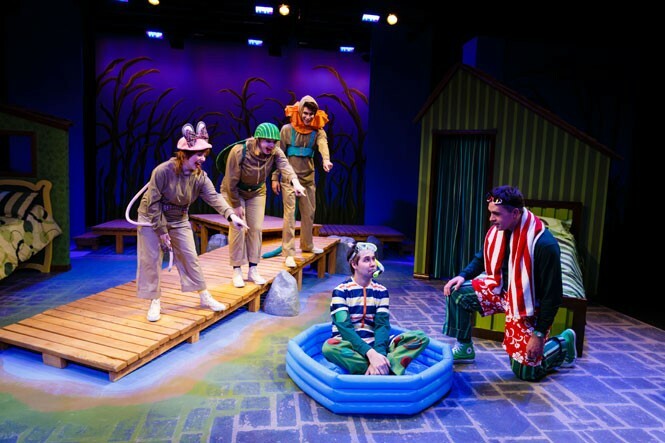 Peter & the Starcatcher is aimed at a somewhat older audience than Frog & Toad, but is no more concerned with being a staid, boring portrait of mundane jejune normal life. A prequel to/riff on Peter Pan, PTC's production mines similar theatrical traditions as its recent One Man, Two Guvnors, if in a slightly less ribald fashion: women characters played by men in drag for comic effect, mustache-twirling villains and broad fourth-wall breaches. The jokes are proportionately a little more layered, with an element of "if you get this reference, pat yourself on the back" hipness, when they're not broad fart jokes. In that duality is another element of the appeal of children's entertainment pitched at this particular age group: the way in which works are designed to cater to both the kids and their parents. It is striking, and warrants interrogation, that children's theater (and entertainment in general) is characterized by its un-reality. One interpretation would be that there is no reason to subject the young—still possessed of an innocence that becomes untenable the more one engages with the broader world—to the unpleasant things in life. While this is certainly practical—and, let there be no mistake, a good idea—this leads to a world of potential for artists who choose to work in more presentational, non-naturalistic forms. It bears remembering that while, in the theater, actors may indeed be physically in the audience's presence, the scenes they play out are not "real." They are fictions, make-believe. But the real reason clear make-believe connects with kids is that honest acknowledgment of its un-reality. Kids are nothing if not honest. Look, if any proof is necessary, take that kid in the opening paragraph, yelling and playing with the cell phone.